Are you interested in being a garden manager this summer? Hope Gardens is looking for two Garden Managers to lead and operate Hope Gardens from May 17th to July 27th! The summer is the time of year that our garden is the busiest, so this is an excellent opportunity to get experience with management, experience working with a non-profit, and to get really involved in the garden! The summer garden manager position is a ten-week position with a ten to twelve hour commitment per week. Additionally, this is a paid position! This position pays $11 an hour. If you're looking to acquire management skills and earn a little extra cash this summer, this position is perfect for you! A note: This is a physically active position. Managers must be able to stand and walk for long periods of time, to bend at the knees and hips, and to lift at least 30 pounds overhead. This position involves a good portion of time outdoors, in all of the weather conditions that North Carolina presents. Do you have any ideas for engaging volunteers during volunteer days? Do you have any other summer plans or commitments? Applications submitted by Friday, April 19th will be given priority consideration. Interviews will be conducted the following week. Please note that incomplete applications will not be considered. The position does include a few requirements as well. We do prefer UNC Chapel Hill students to be our summer garden managers, but we do welcome all community members. We do require you have access to a car, as driving is required to and from the garden. Previous experience with gardening or leadership, previous volunteer or community outreach experience, and interest in food systems, environmental education, and sustainable agriculture are very helpful as well. Please contact cochairs@nchopegardens.orgwith any questions you have! 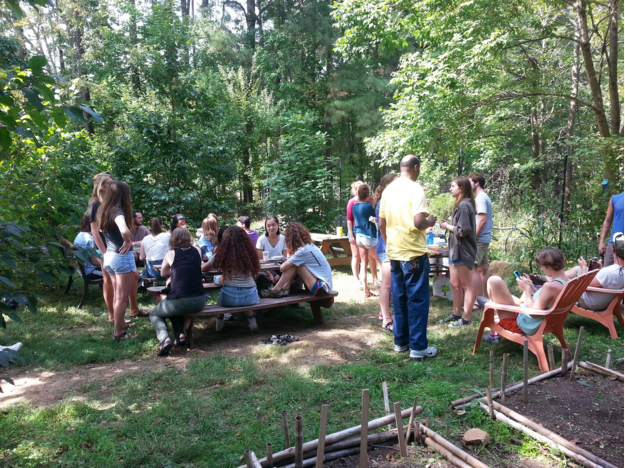 On Thursday, October 5th, the first annual Harvest Moon Celebration was held by Edible Campus UNC. It began at 6:00 with a performance by student band Watermelon Frisbee, who finished off their set with an amazing cover of Can't You See by The Marshall Tucker Band. This casual concert at the beginning gave everyone a chance to make their way up to the food and refreshments at the top of the theatre. This is how Hope Gardens got involved in the event. We had one table where we sold stickers and honey and another where Herban Garden hosted an altered (but delicious) version of Tea Time. There was also "famous sweet potato chocolate bread" that actually lived up to its name. The speaking began at 6:30 and a particular point of emphasis across multiple speeches was the plight of immigrants in the agricultural community of North Carolina. Andrea Reusing, the chef and owner of Lantern Restaurant in Chapel Hill, pointed out the abundance of undocumented immigrants in our state who harvest our food while they themselves remain food insecure. Two of the speakers, Jamil Kadoura and April Oo, were immigrants hailing from the Middle East and Burma respectively; each of whom shared their own unique experiences with food and agriculture as immigrants in North Carolina. These messages served as a powerful reminder of who we serve and and how far we still have to go to achieve agricultural stability in our state for ALL people. In addition to speakers, there were also poets who graced the stage to recite their food-inspired poetry. The standout was Jackson Hall, a masters student in folklore at UNC who gave the final performance of the night. I've never heard anything so poetic. It was hard to tell where his introduction ended and his poetry began, it all came out so naturally. When he started to describe the Black Forest cake that his grandmother used to make for him when he was a child, I'm almost sure my mouth was fully agape. Food is such an important part of the human experience and it's truly awe-inspiring to be so intimately exposed to the effect that it's had on the lives of others. The event was originally described as an evening of storytelling, spoken word, song, and sweet potatoes and it gave us everything we were promised and more. To the members of our organization, I hope you have a fantastic fall break and I encourage you to continue attending events such as this that promote sustainable agriculture and food insecurity. Even if they aren’t hosted by Hope Gardens, everyone serves to gain from the food groups on campus working together and supporting one another, especially those we aim to serve. If you came out to Campus Y’s spring semester open house on January 25th, then Hope Gardens might have had the chance to talk you! The open house gave a glimpse into the multiple organizations at UNC that is connected to Campus Y, the university’s hub of social justice and innovation. The packed crowd that came on Thursday shows the passion UNC students have for committing to make a difference, and we were happy to see that! One way to make a difference is by addressing the needs of the Chapel Hill area surrounding food insecurity. Hope Gardens approaches this issue using sustainable agriculture and tools to get the community involved in growing at our garden down on 2200 Homestead Rd. New members are always welcome to help further our mission. If you couldn’t get the details of what else Hope Gardens does, no problem! Come down to our weekly general body meetings at 1789 Ventures (next to Ye Olde Waffle Shoppe on Franklin St.) on Tuesdays 7:15-8:15 pm and come join a workday at the garden on Saturdays 10 am - 12 pm. Rides are provided at 9:45 am in front of Campus Y. Want to see if you have a green thumb? Wishing you could see our beautiful garden firsthand? Join us at our next workday on Saturday, September 10th! Love what we do but don’t want to get your hands dirty? Our general body meetings will be held every Monday at 7:15 pm in 1789 Venture Lab starting September 12th. We hope to see you there! If you couldn’t BEE at the Science Expo, here’s what you missed! Once again, Hope Gardens joined the UNC Science Expo on April 9th for another year of interactive and educational fun! This free event welcomes people to learn and experiment with a range of topics in STEM. Hope Gardens centered our exhibit on spreading awareness about the significance of bees. The event was a blast as we had fun showing people the steps involved in harvesting honey and letting them try out the equipment used in the process, including trying on a real beekeeper suit! People also got a taste of our delicious wildflower honey harvested from the hive at the garden! We currently have two hives that hold around 40,000 bees each and is maintained organically. But, if you couldn’t make it out to the expo, don’t worry! We just harvested more honey that will be up for sale! You could also come to the garden at 2200 Homestead Rd, Chapel Hill on a Saturday workday and ask to check out our hive. As always, workdays are 10-12pm and open to everyone! Most importantly, however, is at that families, kids, and people of all ages were able to see how essential bees are as pollinators and producers of the honey we love at this event. Unfortunately, they are declining at alarming rates, due in part to industrial agriculture and the use of bee-killing pesticides. To ensure that we protect these amazing creatures, consider buying local, organic honey, avoiding pesticide use, and planting bee-friendly flowers (learn more about bees here). A community member taps a dowel into her mushroom log. Jeremy demonstrates how to drill the holes for the dowels into a log. As April approaches, Hope Gardens seems to be getting busier and busier from events at the garden to events at UNC’s campus and beyond. With each event, we strive to work towards our mission of increasing food access in a sustainable manner, so please stay tuned for more of our upcoming events and updates. We always appreciate your contributions and interest! Here’s a look back to just a week ago where Hope Gardens participated at the “Eating to Make the Earth Last” event that was featured on Campus Y’s social justice blog, The Arc. To learn more about the event and our involvement, please click here! More importantly, the article was written by one of our very own development team members, Laurel C.! Earlier this month, representatives of Hope Gardens had the honor of attending the Annual University Martin Luther King Jr. Day Memorial Banquet and Award Presentation. This event was held the evening of January 17th in the Friday Center for Continuing Education, and celebrated the legacy of Martin Luther King Jr. by honoring individuals and organizations whose actions reflect a commitment to serving their local community. A highlight of the banquet was the powerful keynote speech given by Dr. Rosalind Fuse-Hall, President of Bennett College and proud UNC alumna, titled “A Dream Deferred: The Time is Now”. In this speech, Dr. Fuse-Hall spoke powerfully on the importance of youth being both allowed and encouraged to pursue their dreams and passions from a young age. Her point was driven home with moving quotes from the Langston Hughes poem “Harlem (Dream Deferred)”, which painted a picture of the consequences of a dream left unfulfilled. She also stressed the unsettling fact that a large percentage of minority youth doesn’t have access to the American dream due to a lack of resources and support. Dr. Fuse-Hall concluded her speech with a powerful call to action, urging every American to not only do everything within their power to make their own dreams a reality, but to help others reach their dreams as well. During the award presentation portion of this event, Hope Gardens and Heavenly Groceries each received the “Bridge Builder” awards, which recognize organizations that have built meaningful, positive relationships with their surrounding community. Hope Gardens was honored to be recognized for our efforts to combat barriers to food access in the Chapel Hill community, a mission which manifests itself through our connection with the Interfaith Council Shelter, Homestart Women’s Shelter, and our community gardeners. Co-chairs Sierra Houck and Sierra Dunne were proud to represent Hope Gardens at this special event (see picture below). This award is a testament to the positive impact Hope Gardens has on the greater Chapel Hill community, and we thank each and every member for all of their hard work in making this happen! Hope Gardens was featured on North Carolina Homes! Let’s face it: You’ve been stuck in the library ever since the second week of classes. Your dorm room is starting to feel pretty cramped. After working so hard on that nice Summer tan, you’re now beginning to see the symptoms of vitamin D deficiency. All you want is to feel the Sun on your face again, and Hope Gardens is the perfect opportunity for it. Stretch your legs and get a little exercise, because the library is for Winter! And who doesn’t secretly want to be that peace-loving, romantic home-grown farmer type? Come on, it’s like free horticulture education anyway! Learn how to grow your own food, for your own nutritional and spiritual well-being. Not to mention becoming that good-looking, agro-chic gardener you always knew you were. As much fun as working in Hope Gardens is on it’s own, you can feel good about helping others out too. Our urban farm efforts are focused on feeding the Chapel Hill-Carrboro community. We aim to address barriers to food access. The sad reality is many folks don’t have an easy way to the grocery store, let alone reliable access to fresh fruits and vegetables. Let’s make a difference! You’ve spent 18 of the last 24 hours looking at a monitor while sitting in a boxed room. But you try not to think about that. Come out to Hope Gardens and experience the purest form of reality, the natural world. Ghandi said, “to forget how to dig the earth and tend the soil is to forget ourselves.” Who are you to dispute Ghandi? Besides, interacting with nature is good for you. Getting your hands dirty promotes healthy bacteria–and when flu season comes around you’ll be grateful you got involved! And what better way to become close to someone? Take away all the distractions– cell phones, schoolwork, loud parties. When you’re out in the gardens, you’re kneeling in the grass next to your two new friends. You’re all weeding together and talking, and you realize how natural forming bonds comes while ripping roots out. Your dining plan is just NOT cutting it, and eating out on Franklin is draining your savings account. Luckily, Hope Gardens hosts monthly Potlucks with tons of free and yummy food. A lot of it will come straight from our plots, so you know it’s fresh, healthy and delicious. You were born in the 90s when fastfood and processed snacks reigned supreme. But you’re part of a new generation, and those days are over. Your birthright is real, clean food. You want to make a difference, even if it’s small. And supporting local, sustainable agriculture is a powerful and easy step towards food justice and green living. Your troubles are back at school. Gardening demands your attention and requires mindfulness. It’s meditative in it’s own way. Try it and see. HOPE Gardens is a small operation, but every year we grow. Each generation of UNC students leaves something behind for the next. Over time, our roots have grown deep and strong. Become a part of an organization you can have longlasting pride and participation in. Hope Gardens is a community. We’re based around students, but we touch the lives of so many people in our area. When you work in the Gardens, you’ll meet all sorts of people from all walks of life. You’ll gain an appreciation for the necessity diversity–both in people and in plants. Cultivating crops is not unlike cultivating relationships; you’ll appreciate that there’s a certain equality in all things. You’re not the boss of the plants, nor are you the boss of other people. Rather, you’re a servant and participant. It takes a patience, and grounded humbleness to grow food. This translates to how you build friendships with others. It’s about cultivating humility and providing attention to those around you. If you’re interested in getting involved with Hope Gardens this year, keep checking our website for information about how you can get more involved with garden workdays, cooking classes, food donations, and more. We do carpool to the Gardens on Saturday mornings. The car meets in front of the Campus Y at 9:45am. Email us for more info!